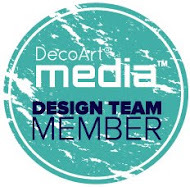 DecoArt is such a great company to design for. I have so much fun with their amazing Media line products. 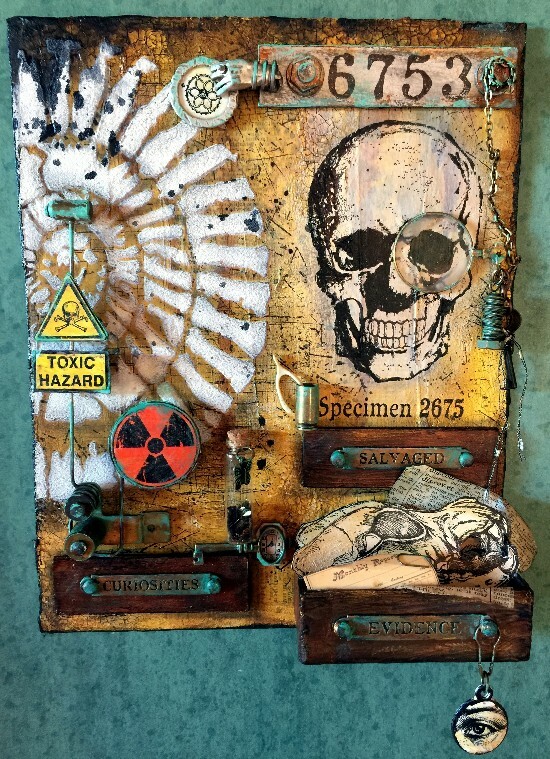 DecoArt Mixed Media Blog and Stampendous' Blog. 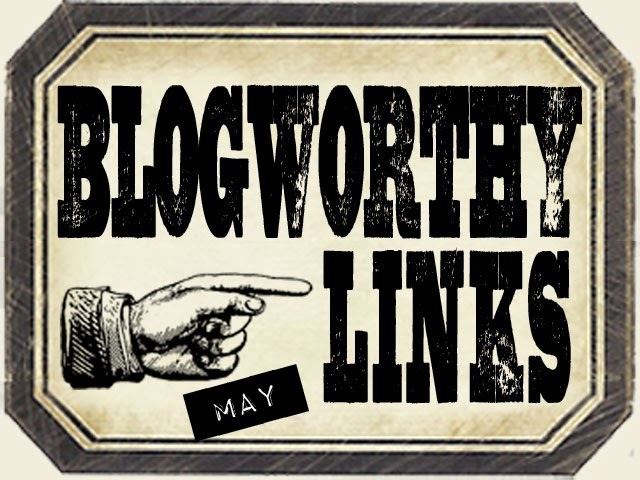 Here is the piece I've created for this blog hop. I call it "Unexplained Toxic Skuldoggery" after the three sets of Andy Skinner Stampendous Stamps I chose. HERE is a link to see all of Andy's amazing stamps at Stampendous. I chose these three different stamp sets from Andy Skinner as the focus of my 8" x 10" canvas board. 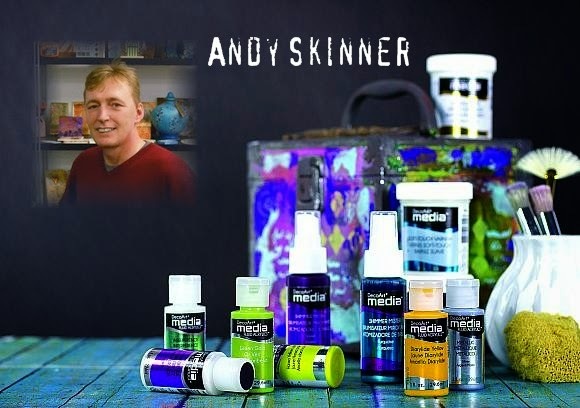 I love Andy Skinner's techniques using DecoArt Media products. 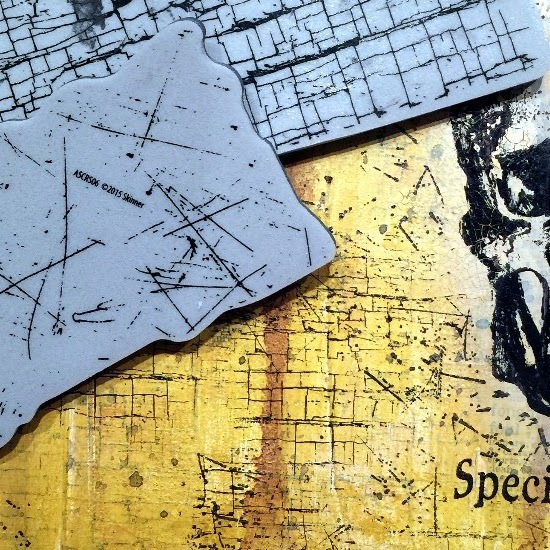 His stamps and stencils are also awesome! 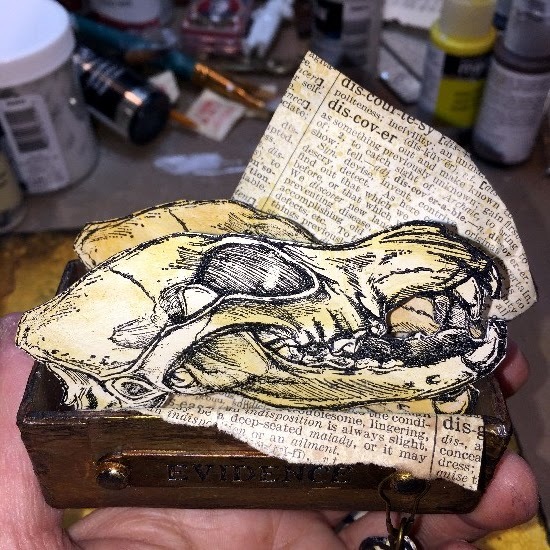 So this was a natural combination for me: Andy Skinner Decoart Media products, his Stampendous Stamps and his fabulous DecoArt 8" x 8" Fossil Stencil. Pretty much as always when I sit down to create something, I have no idea what I'm going to do. I just jump in and see where it goes. This was no different. 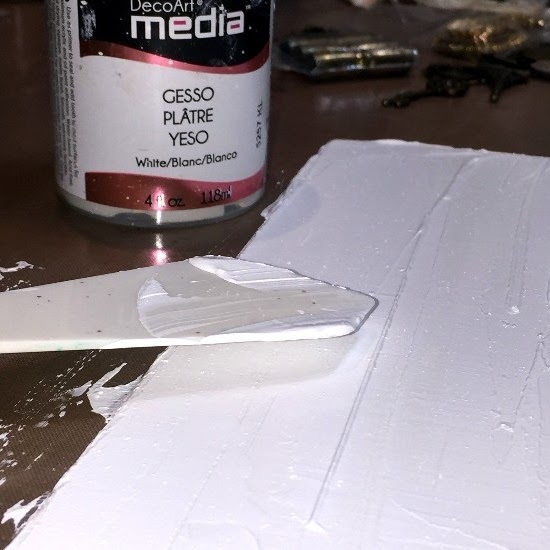 I knew I wanted texture so I started with a palette knife and a generous layer of DecoArt Media White Gesso covering the entire surface of the canvas board. I set it aside to dry although you can gently heat set it. I wanted some unexpected dimension on this flat canvas board so I decided to create a little drawer and two other drawer fronts. One drawer would be like it was pulled out and there would be two more drawer fronts as if they were shut. To create the drawer and drawer fronts, I cut pieces measuring 3 1/2" x 1" out of chipboard. The open drawer required two pieces of 3/12" x 1" strips (front and back), two 1 3/4" 1" strips (two side pieces) and a 3 1/2" x 1 3/4" piece for the bottom of the drawer. Then I cut four 3 1/2" x 1" pieces, glued two together and that created the other two drawer fronts. Next I assembled the drawer using "structure strips" (as my friend, Jim the Gentleman Crafter) likes to call them. These are 1" strips of cardstock that are scored in the center. 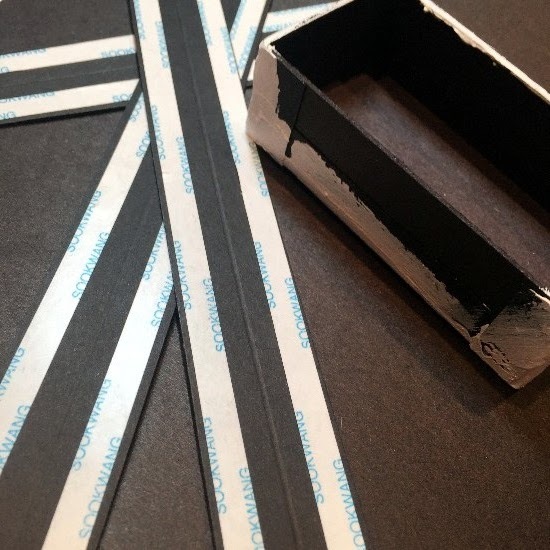 Double sided tape is applied to either side and then these strips are attached at the joints of the box (or in this case "drawer") that you are making. This holds them together and provides extra support. To create the drawer and drawer fronts, I cut pieces measuring 3 1/2" x 1" out of chipboard. The open drawer required two pieces of 3/12" x 1" strips (front and back), two 1 3/4" 1" strips (two side pieces) and a 3 1/2" x 1 3/4" piece for the bottom of the drawer. I used the structure strips to join the drawer together. Then I cut four 3 1/2" x 1" pieces, glued two together and that created the other two drawer fronts. 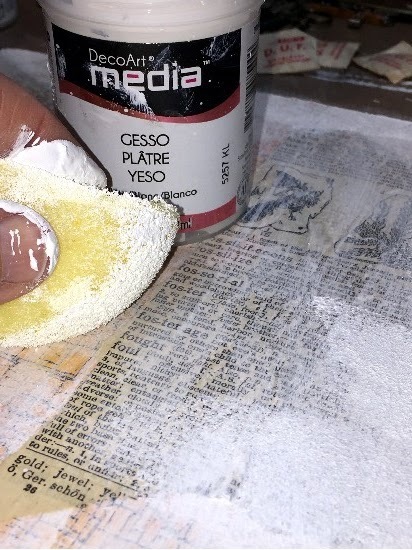 Once that was done, I used my finger ... my favorite art tool ... to cover all exterior sides of the drawers with DecoArt Media White Gesso. I intentionally tried to make the surface resemble wood grain then I gently heat set all of the pieces. 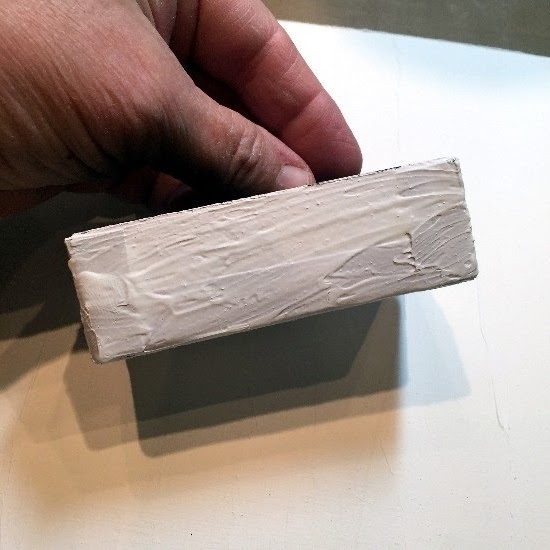 Here is how the front of the drawer looks once the gesso is dry. All of the sides and the other drawer fronts also look this way. 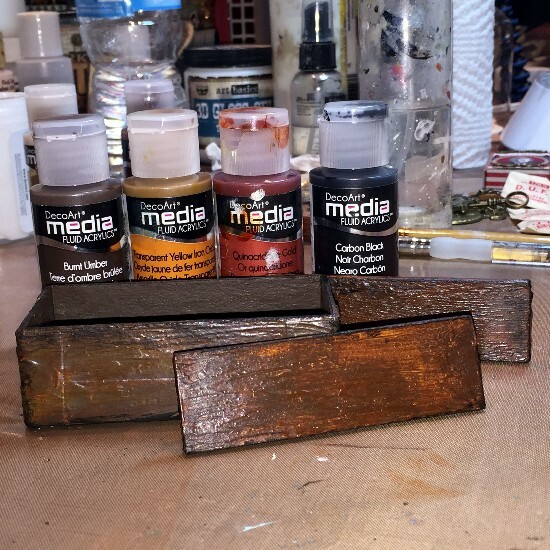 Now with the magic of DecoArt Media Fluid Acrylics Burnt Umber, Transparent Yellow Iron Oxide, Quinacridone Gold and Carbon Black, the white gesso drawers are transformed into "wooden" drawers. I simply used my fingers to rub on the colors, starting with Burnt Umber then Transparent Yellow Iron Oxide, followed by Quin Gold and finally a little Carbon Black around the edges. 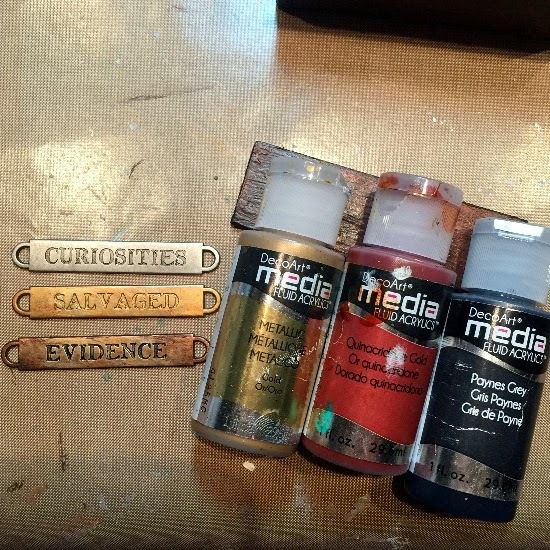 To alter the silver word bands, I simply swiped them with DecoArt Media Fluid Acrylics Metallic Gold first. 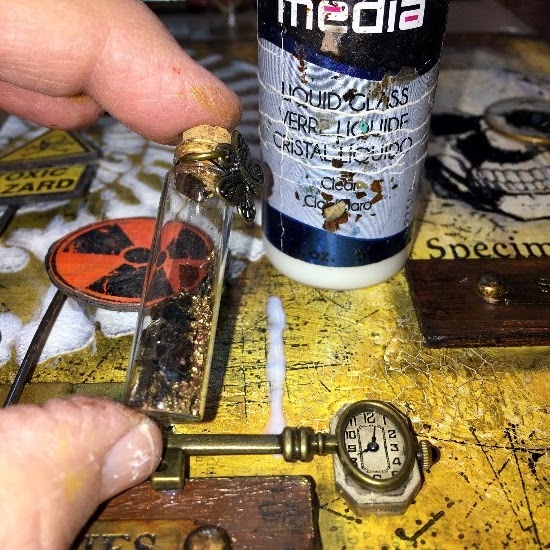 Next I added just dabs of Quinacridone Gold with my finger to give a rusty appearance. Heat set each layer of paint. Next I swiped Payned Grey across the top of the word band to fill in the letters. Then I quickly wiped off the excess dark grey paint, leaving it only in the indented letters. Last, I added a few more layers of the gold and Quin Gold, dabbing with my finger to build up the weathered layers. Finally, I added just touches of black around the edges of the word bands to give them a more aged appearance. Here is the drawer and the drawer fronts all assembled. I used a bead of DecoArt Liquid Glass behind the word bands and brads to hold them in place. I love the way they look like old worn drawers! 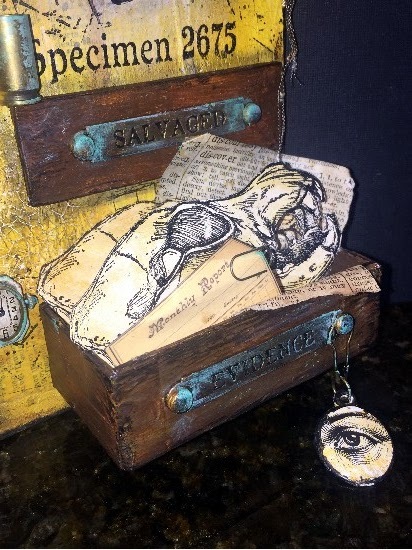 I wanted to add a little dangling charm on the drawer so I pulled out this Tim Holtz piece, added some DecoArt Media Transparent Yellow Iron Oxide to the white enamel finish (using my finger), heat set it and added the rub on. It turned out pretty cool! I attached it to the drawer using a Making Memories clip pin and a jump ring. Now to work on the basic canvas board background some more. First I brushed on some DecoArt Media Fluid Acrylics Yellow Oxide and wiped off the excess with a moist baby wipe. Then I followed that layer with a layer of Transparent Red Iron Oxide and wiped off the excess. 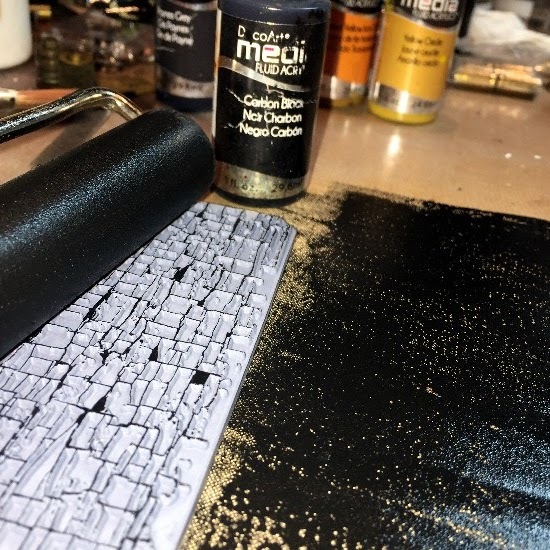 Next I brayered some DecoArt Media Fluid Acrylics Carbon Black onto my craft mat surface and then rolled it over the crackled looking background stamp from Andy Skinner's Toxic set. 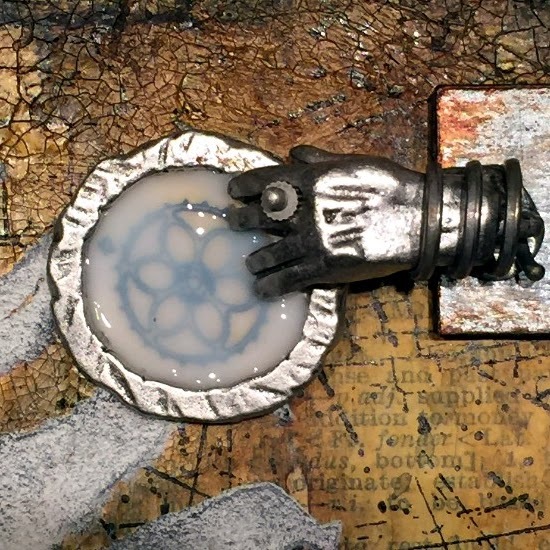 I could also have just pressed the stamp into the paint that was brayered onto my craft sheet to "ink it up". I randomly stamped the image on the canvas board and then immediately washed the stamp. Here is the way the background board looks at this point. I LOVE this stamp effect but I think I got too much of the stamp on the background. So ... let's do some more layering! I used my finger and a sponge to add more DecoArt Media White Gesso randomly over the surface of the stamped background. 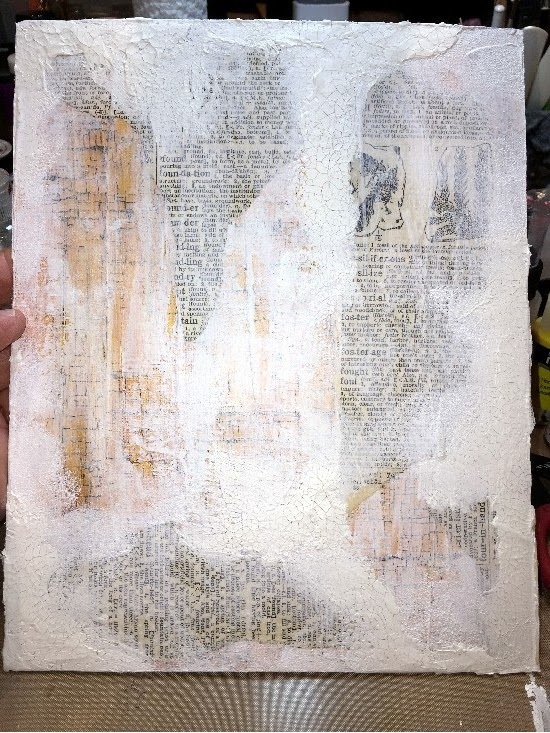 Then I added some torn dictionary pages over the Gesso using DecoArt Media Matte Medium and a brush. I brushed over the surface of the background first to glue on the dictionary pages. Then I brushed Matte Medium over the dictionary pages to seal them in place. The Matte Medium dries clear. I blotted on a little more of the DecoArt Media White Gesso over the dictionary pages to blend them into the background. Then using my finger again, I added some DecoArt Media Crackle Paste on top of the background. 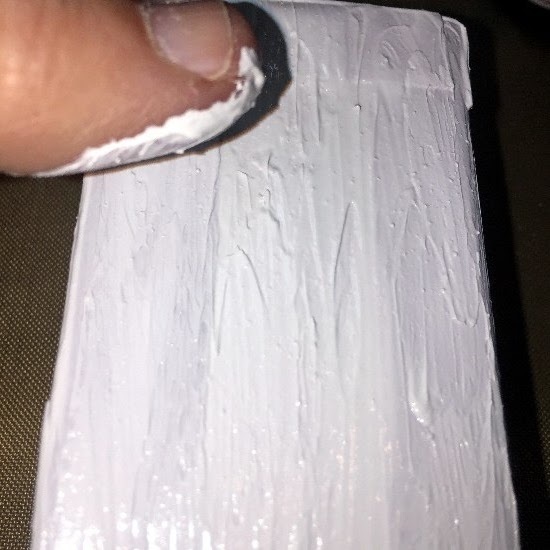 This dries white opaque. 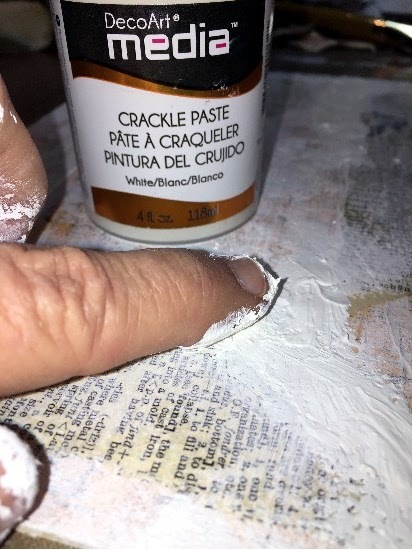 You need to let any of the Media line Crackle Products dry naturally in order for the crackle to really work properly. Here is the new and improved background. You can still see some of the original color and crackle stamp peeking through. 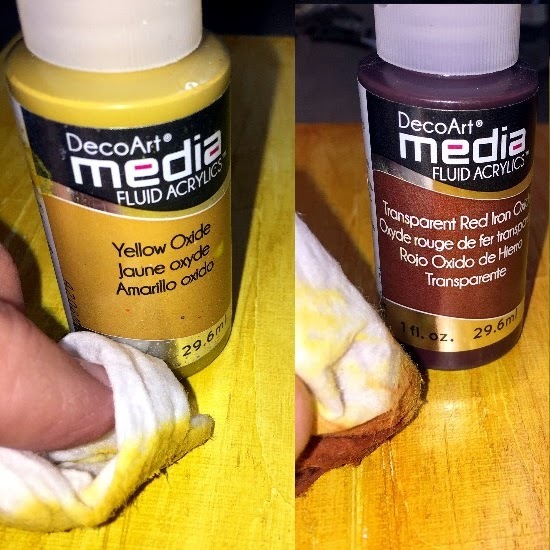 I brushed on more of the DecoArt Media Fluid Acrylics Yellow Oxide and wiped off the excess with a baby wipe. 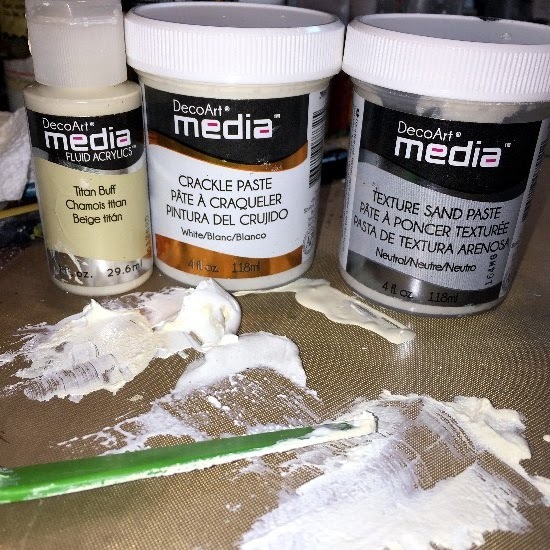 Then, I mixed first DecoArt Media Fluid Acrylics and water together, I ran a brush across the top of the canvas, held the canvas upright and allowed the paint to run down the canvas. I also spritzed the paint with water to assist in the runs. Then I laid the canvas down and heat set the runs in place. I repeated this process until I was happy with the look. 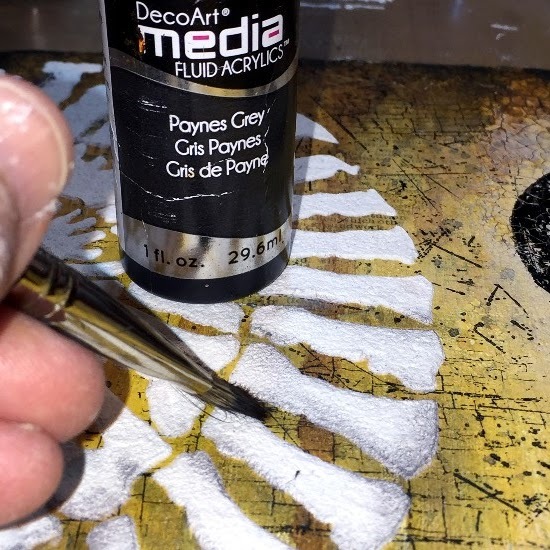 I repeated this process with the DecoArt Media Fluid Acrylics Carbon Black, only not adding as much black paint to run down the canvas. I like the results! 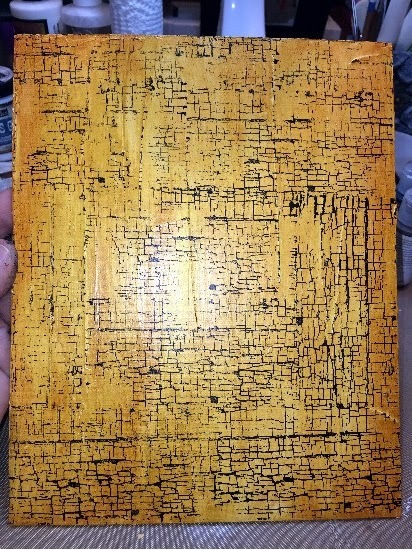 Then I flicked a little of just the black paint randomly onto the surface of the canvas board and heat set it. used a baby wipe to add a light coat of DecoArt Media Fluid Acrylics Titan Buff in this area of the canvas board. Then I heat set it to dry. The inset picture shows you what the skull stamp looks like once it was stamped over the dry Titan Buff paint. 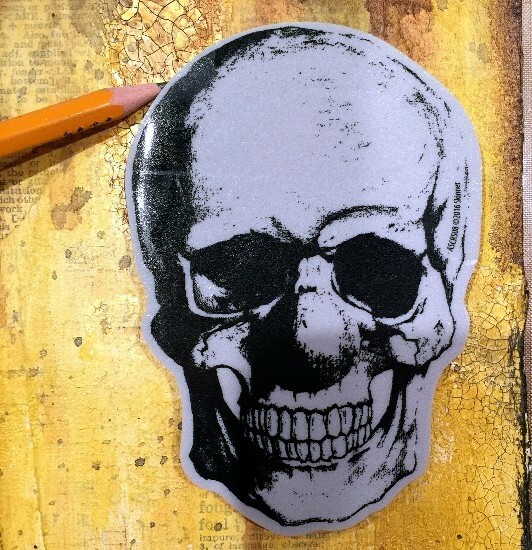 Instead of just stamping these very cool prehistoric skulls onto stamping paper, I experimented with added a little texture to the paper first. 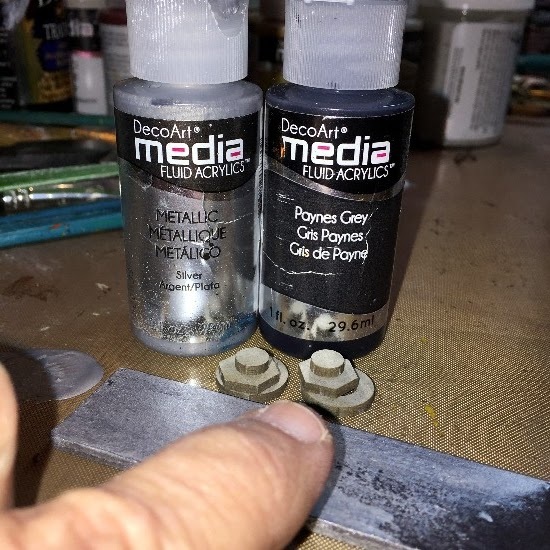 I added a very small amount of DecoArt Media Texture Sand Paste to some DecoArt Media Fluid Acrylic Titan Buff paint. I mixed it up, spread it onto the stamping paper with a palette knife and then my finger. Then I heat set the paint. 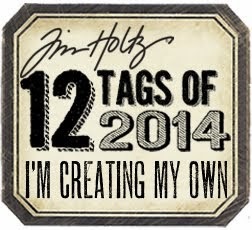 Next I stamped several images and chose my favorite two to use on my piece. I colored them using DecoArt Media Fluid Acrylics Transparent Yellow Iron Oxide followed by Quincridone Gold and finally watered down Paynes Grey. I used very little paint on my brush when adding the color. 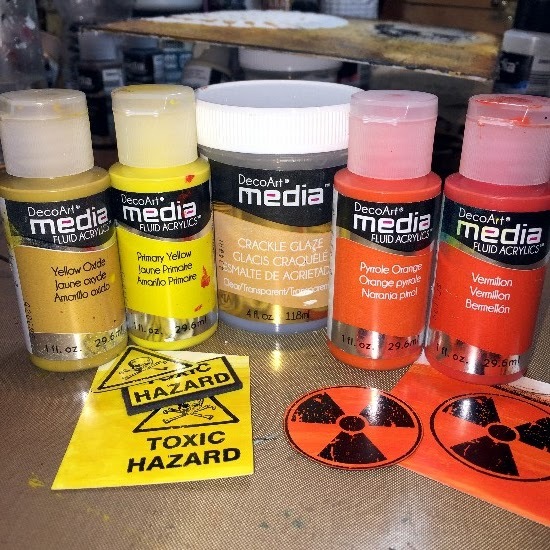 Since Transparent Yellow Iron Oxide and Quinacridone Gold are fairly transparent paints, they did not cover up the black stamp lines. I cut out the skulls and added them to my "drawer". I also put some dictionary paper behind them to add interest to the drawer. Now it was time to add more stamping to the background using Andy Skinner's background stamps from the Toxic stamp set. Again, I randomly stamped the images using Permanent Black Ink. 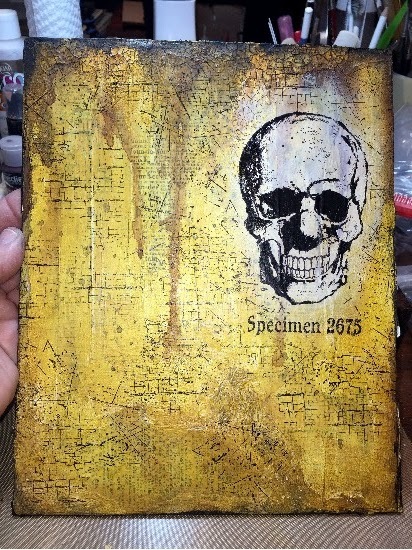 The "Specimen 2675" is stamped in Permanent Black Ink as well and came from Andy Skinner's Skuldoggery stamp set, as did the skull. This is what the board looks like at this point. Now it was time to pull out the Fossil stencil and add it to the left side of the canvas board. 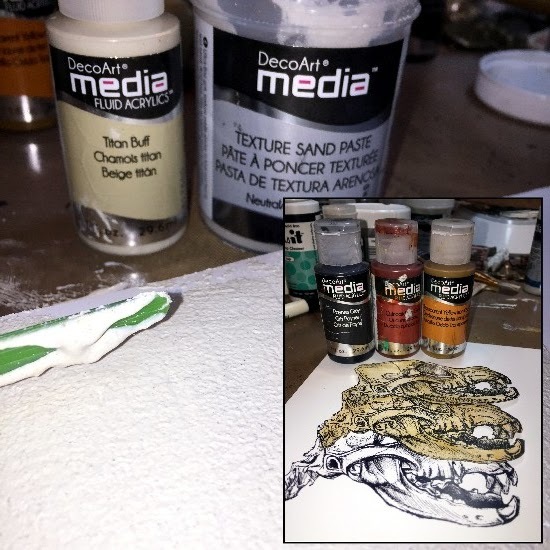 I taped the stencil in place and created a texture concoction out of DecoArt Media Texture Sand Paste, Crackle Paste and Titan Buff. I would scrape this over the fossil stencil to create a boney image with texture. 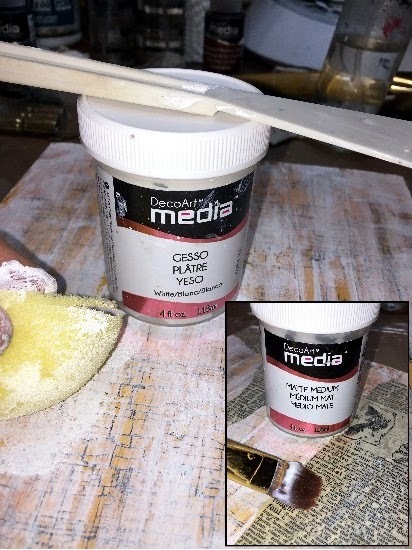 Once the stencil image was covered, I removed the stencil and immediately washed the stencil and palette knife. I left the fossil image to air dry. Once the fossil stencil was allowed to dry naturally, I added some shading using DecoArt Media Fluid Acrylics Paynes Grey and almost a dry brush effect over and around the stenciled image. Now it was time to start stamping and adding my embellishment pieces for this canvas board. 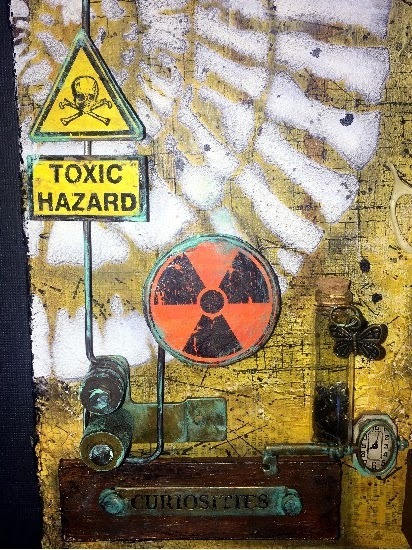 I chose the Toxic Hazard and toxic danger symbols from Andy Skinner's Toxic stamp set. 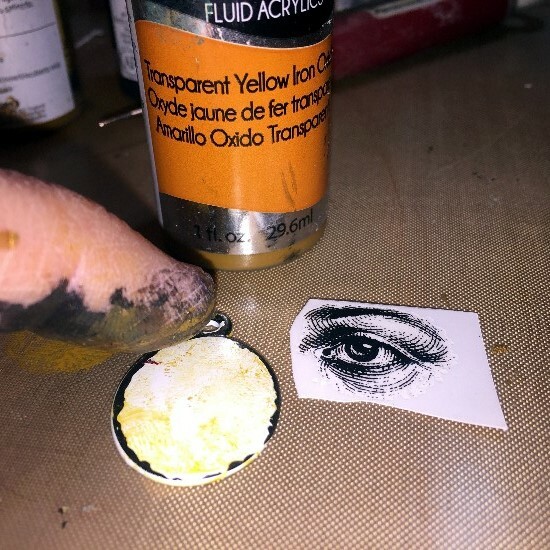 I used my finger to add DecoArt Media Fluid Acrylics Yellow Oxide and Primary Yellow onto a piece of stamping paper. I also created some orange paper by swiping DecoArt Media Fluid Acrylics Pyrrole Orange and Vermilion onto a piece of stamping paper. I heat set the colors dry and then stamped the images onto the paper using Permanent Black Ink. Once dry, I added some DecoArt Media Crackle Glaze and let it air dry. Next I added some DecoArt Media Burnt Umber Antiquing Cream into the creveases created by the Crackle Glaze and wiped off the excess. I cut out the images and mounted them onto black chipboard for more depth. Then I glued them onto an interesting metal piece I found laying around. Here is what those pieces finished out looking like before I decided to add a patina look. Next I laid the pieces in place to see how the canvas was going to take shape. Yep...I like it! It was time to start gluing everything in place. My dear artistic friend and blogging buddy, Gaby Bieberle from Germany recently sent me some amazing little "goodies" to work with! She is so sweet and generous and I totally LOVE her work! Anyway, I am using a few of the wonderful little treasures she sent me on this piece. A watch face and a key are pictured here. I glued them in place using DecoArt Media Liquid Glass. It goes on milky but dries clear. I love using it to create a faux glass look or for gluing on smaller items. Here I have run a bead of the Liquid Glass and am getting ready to glue down a glass vial with small mica chips and glitter glass in it. Next I created a plaquette from black chipboard to go above my skull. It is 4" x 1" and is double layers thick. Using my finger, I brushed first DecoArt Media Fluid Acrylics Metallic Silver over the chipboard. I then added a light random layer of Paynes Grey; particularly around the edges of the plaquette. I covered the nuts and bolts left over from a very cool Andy Skinner's Tando Creative Industrial Elements chipboard set the same way that I did the plaquette. 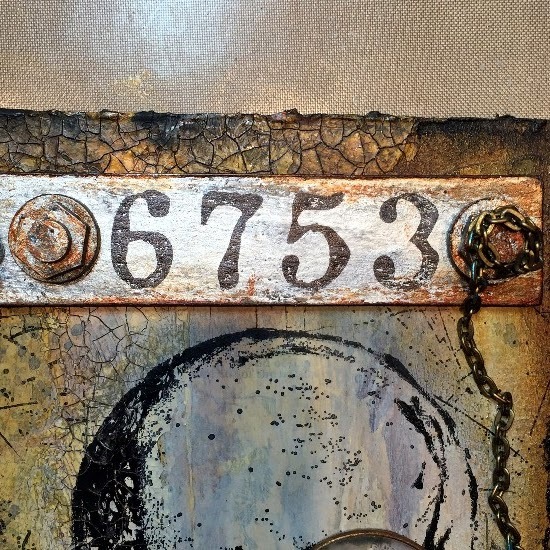 Next I randomly added some DecoArt Media Fluid Acrylics Quinacridone Gold to give everything a rusty effect and then I stamped "6753" (partial numbers from a stamp) from Andy Skinner's Unexplained stamp set. 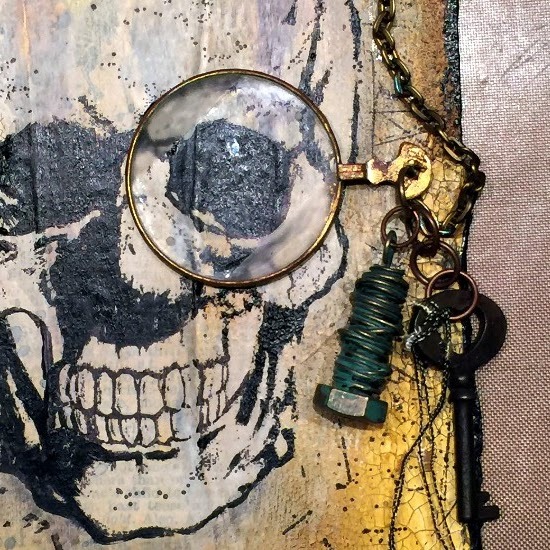 I added a bullet casing that Gaby had sent me and a Tim Holtz wishbone to it. It sits on top of one of my drawer fronts. To the left side of the plaquette, I added this quirky hand charm. I added a rub on in the center of the circle and filled it with DecoArt Media Liquid Glass. It is milky right now, but will dry clear. I added an optometrist's glass over the eye. It was glued in place using DecoArt Media Liquid Glass. Then I dangled a patina wirey screw and an old key from the glass using a couple of jump rings. I also added a chain going up from the optometrist's glass to the plaquette above. 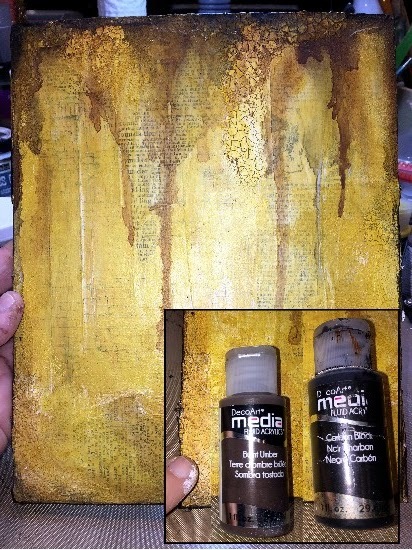 I really liked the look of the patina finish on this canvas so I decided to create my own patina and add it to other elements. 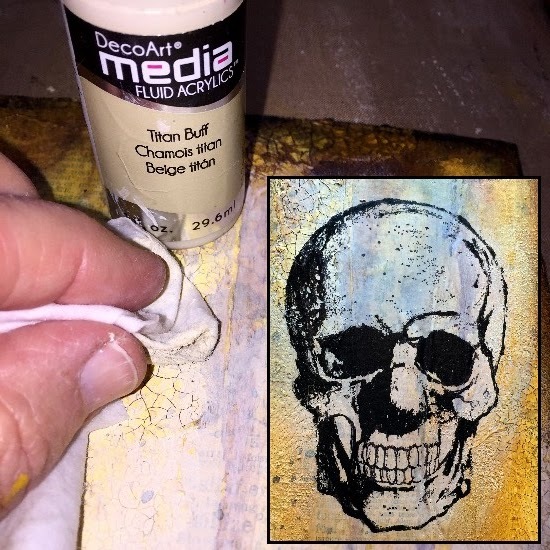 To do this, I simply mixed a very small amount of DecoArt Media Fluid Acrylics Titan Buff with Glue Green Light. Using my finger, I gently added the greenish color to various objects and I LOVED the finished result! 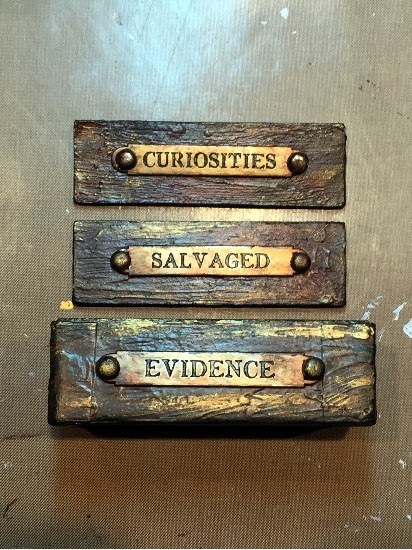 Here are the labels on the drawers with the patina look. You can also see a little patina added to the watch face and key to the left. 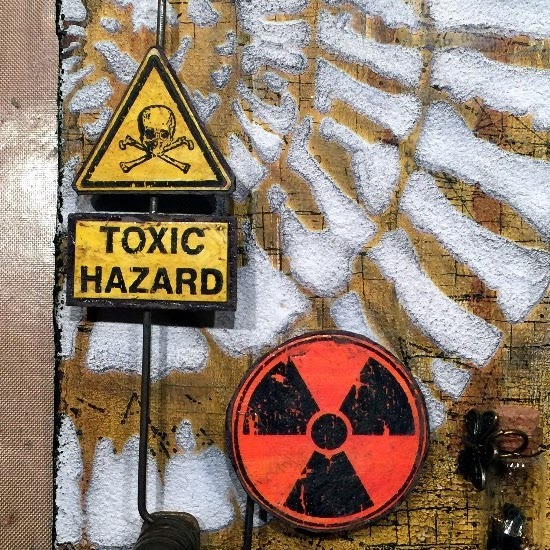 Here you can see the patina added to the metal pieces and the Toxic signs. I think this gives them even more of a metal look; even though they are chipboard. 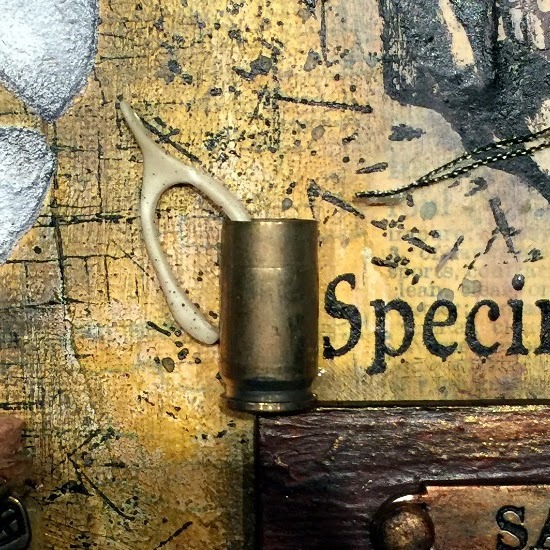 You can also really see the patina added to other elements of this canvas on this finished picture. 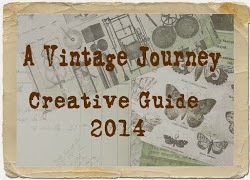 I hope you enjoyed this little art adventure with me using DecoArt Media products and Stampendous stamps! Several of my other DecoArt Design Team buddies have also used Stampendous Stamps to create some beautiful art for you. 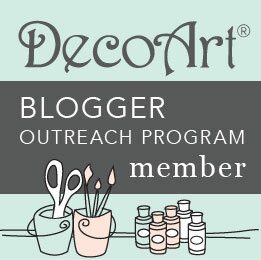 Be sure to check out DecoArt's Mixed Media Blog and Stampendous's Blog for those links and more details. You won't want to miss these very special projects! This is just BEYOND INCREDIBLE. You thought of EVERYTHING! 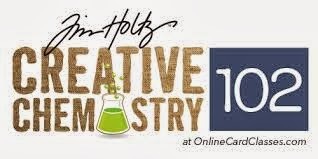 It's TOXIC CREATIVITY at it's BEST. I am just truly blown away by all the incredible colors and textures and uses of products.... WOW. 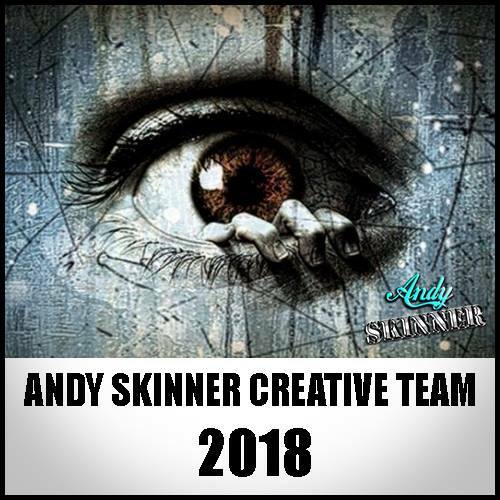 DANGER - DANGER - Evidence states that Candy's brain is short circuiting after hours of creative juices engaged in curiosities unfolding..... need rest, need rest, need rest to salvage.... hehehehe!!! Seriously...I'm AWED. Xj. Thank you so much Joi!! You are so sweet! I definitely loved making this piece. So fun experimenting with different things. ❤️ You, girl! Thank you, Susi. You are always so sweet with your comment. I appreciate YOU! Thank you Brenda! High praise coming from you is so appreciated! I am such a fan of your work. Thank you, thank you for your comments. Magically magnificent! Love all the little details that keep me looking so I don't miss a thing! TFS! Barbara...THANK YOU so much for leaving such a nice comment! Totally blown away-this is perfection. Going to order some more DecoArt-I have to have this in my home. Thank you so much for such brilliant inspiration! Beth...THANK YOU so much, girl! It makes me so happy when my art makes a. Infection with someone! You will LOVE DecoArt products! They are so fun to work with and you always get great results. Anne...as you already know, I truly love your art. Thank you so much for taking the time to stop by my blog and leave such a positive inspiring comment. You have made my day! My jaw is sitting in my lap right now. This is so incredibly AMAZING!!! WOW! Hi Chris!! Wow! Thank you so much! 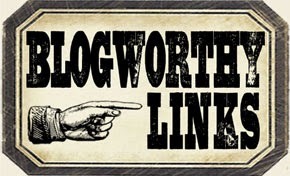 I so appreciate your taking the time to stop by my blog and leave such a nice message. Candy, You know how I feel about your art and this magnificent piece!! You rock and rule girlfriend!! So...this piece is Outstanding! I cannot believe all the freakin detail in this! How does that creative mind of yours work? It must go full speed all the time! Everything about this is just incredible! I especially love the wire parts-so cool! As I said- Outstanding,my friend! Jackie... thank you so very much for stopping by my blog and leaving such kind and positive comments. I always love your art and I always look forward to hearing from you. THANK YOU, friend!!! I love those little 'boxes' and the labels are awesome. Hi April! Thank you so much! I love the little drawers, too. They sure add a lot, don't they? Gertie...thank you so much for stopping by and leaving such a kind comment! I'm so glad you enjoyed the tutorial! Wow!! This is so cool. Every last detail is amazing!!! The background is amazing in itself and then you added soamy awesome details. I love it. Beyond stunning, Candy! You always create the most amazing and inspiring pieces and this is no exception. I just love everything about this canvas. 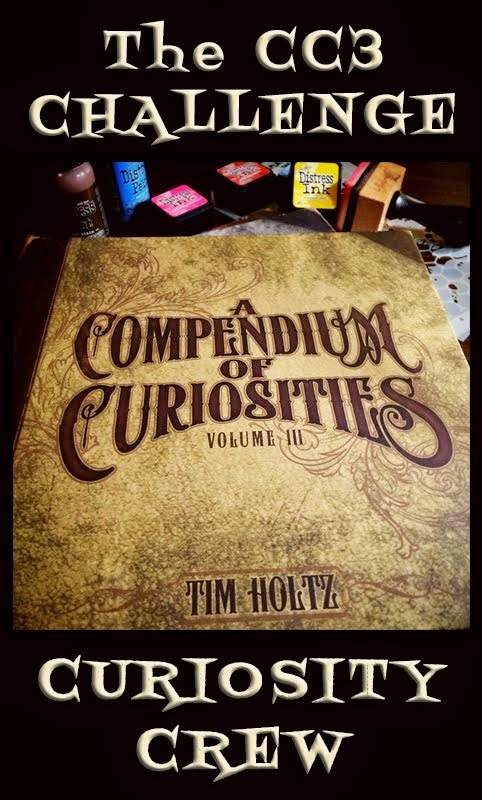 The colors, the layers, the textures, the stamps you used...every perfect little detail. This is truly a masterpiece. I'm pleased to see that you had fun to play with some of the 'goodies' :) Thanks for your fabulous step by step instructions and inspiration! I enjoyed your tutorial as I always do! 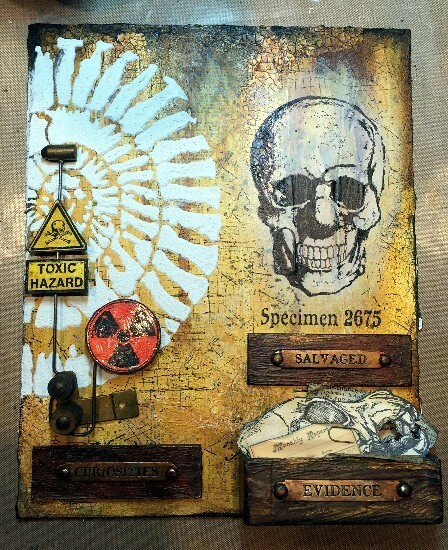 Such a phenomenal project, Candy... the drawer full of skulls and papers is amazing, and all your fantastic paint techniques and effects give this a brilliantly ancient, weathered look. Thanks for sharing all the detailed photos and tips and how-to information.